Home → Writing Life → 1 in 6. Nothing to be ashamed about. Despite what society, tradition, and even loved ones have told me over the years, I’m of the firm belief that being a woman and being a mother do not need to go hand in hand. Another way of saying that? Being childless doesn’t make any female less of a woman; it doesn’t mean she’s unable to fulfill her purpose on this earth or incapable of living a satisfying and full life. However, I also know the desire to be a mother and the excruciating at times soul crushing pain of, month after month, not being able to fulfill that desire. I know the pain of feeling broken, simply because my reproductive organs are. It seems crazy to associate the magnitude of all I am and narrow it down to the functionality of a few organs, but in those dark moments that can happen, and I’m not the only woman to have felt this way. One in six couples in Canada struggle with infertility. And yet, during my first 2 1/2 years of struggle only my closest friends and immediate family knew. Infertility is nothing to be ashamed about. Nothing to keep silent about, and yet so many of us don’t say a word. Instead, we shed our tears behind closed doors. It was around this time that the broken feeling got as bad as it ever has. I was lost. I was scared. I was mourning the life I’d always dreamed of and never believed I would have. So I did the one thing I’ve always done when my pain seemed to much to handle … I wrote. This time, rather than a journal, I focused my pain and hurt and confusion, as well as all I’d learned researching, and threw that energy into a fictional character. Three books about two women who know the struggle, heartbreak, and identity crisis of infertility … and a renewed sense of self for me. Their story is in no way my story. Just as my story of infertility won’t be the same as yours or your sister’s or your friend’s. But each is important and each is worth being told. It is my hope that these books I’ve written go beyond being simple stories and help promote awareness. If you’ve never known the pain of infertility yourself, I hope these stories open your eyes to what that childless woman you know may be going through. If you have, I hope they’re a reminder you’re not alone. I’d love to be able to simply give the books away, but of course, I have expenses. Instead, I’ll do the next best thing. 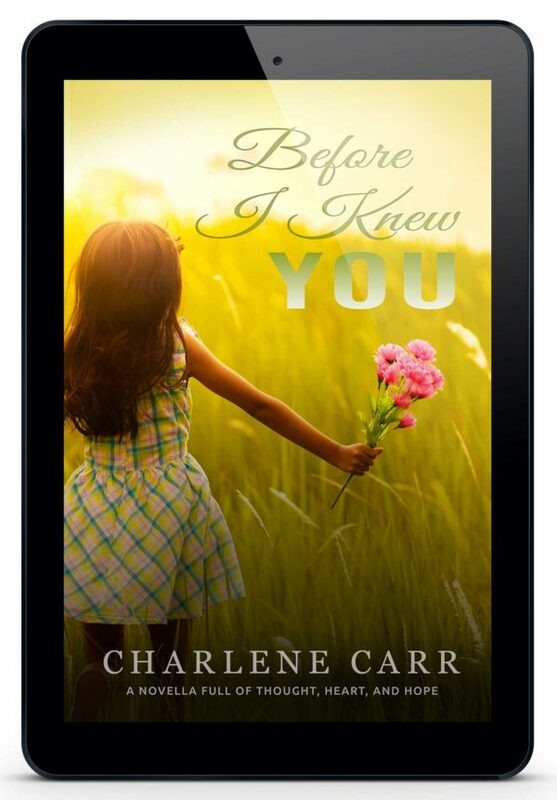 If you buy (or have bought) either Forever In My Heart or Whispers of Hope, I’m offering you a free download of my novella, Before I Knew You. How do you get your free Novella? 1) Open up your copy of Forever In My Heart or Whispers of Hope. Scroll through the table of contents. For Forever In My Heart go to Chapter 11, make note of the first word, then click this link. For Whispers of Hope go to Chapter 20, make note of the first word, then click this link. 2) Enter that first word in the password field, download the appropriate file, load it on your device, then start reading! It’s now been almost four years since I started along this journey of infertility. It’s been the hardest journey I’ve ever taken: from surgeries, to more medications and injections than I ever thought possible, to doctor’s appointments, acupuncturists, naturopaths, yoga, meditation, complete dietary changes (no meat, no dairy, no gluten, no processed sugar or processed food, and no raw vegetables – haha, yeah, that intensity only lasted about six months!) and a whole lot of pain, both physical and emotional. But there’s also been a lot of good. I’m a different person, and I like this person better than the one who started the journey. I’m more patient with myself. And gentle. I know the reward in taking time to relax or just be still. I no longer work myself ragged. I also know that my happiness doesn’t rely on being mother. My husband and I have remained solid, which bodes well for the years ahead. I still genuinely hope I’ll hold my child in my arms one day, but if I don’t it’s going to be okay. I’m going to be okay. My sincere desire is that any woman going through a similar journey will find the peace in her heart to feel the same way. We’re 1in6. We’re not alone. And I fully believe that life in all its misery is also always beautiful – sometimes it just takes a while to find that beauty.